The Freeman Motel was on Lake Avenue in Buena Vista. The Freeman Flop House was “pretty near fit to stay in,” according to the car out front. This car could have been used to take customers out sightseeing, or it could have been used solely for advertising. On the corner of Colo. 291 and U.S. 50, Bert & Tom’s Modern Cottages were an example of tourist cabins that were popular in the 1930s. According to the sign, Bert & Tom’s offered home-cooked meals. The American motel eventually took over in popularity, and by 1960 these types of tourist camps had phased out. Steinbeck wrote memorably of tourist camps as one of the places where the Joad family stayed. This picture was taken around the 1920s. The Sands Motor Hotel, complete with cottonwoods sculpted to look like palm trees, was on Colo. 291 directly across from the outlet of West Third St. If you wanted to entice families to your establishment, a pool was an amenity that the kids always clamored for. The Sands is now an apartment complex. The Westerner Motel, located just west of the HRRMC Medical Clinics at 550 U.S. 50, is currently vacant. The Rainbow Motel and Service Station was at 101 W. U.S. 50. A motel and service station in one capitalizes on the two most common needs of a car traveler. This motel was directly across from the F Street turn. The Mountain View Motel was about ¼ mile east from the U.S. 285/50 junction in Poncha Springs. The Ranch House was at 7545 W. U.S. 50. Today it is the American Classic Inn. The Shawano Motel was at 525 W. U.S. 50. Today it is Loyal Duke’s Lodge. 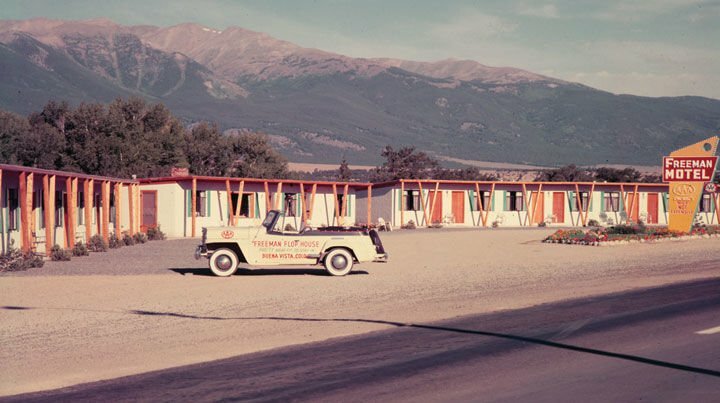 The Silver Wheel Motel, on U.S. 24 in Buena Vista offered tub baths for the weary traveler. Mount Yale is visible in the distance. The West Wind Motel at 1146 U.S. 50. Today it is the Budget Lodge. The Colorado Lodge was at 352 W. U.S. 50. Today it is the Great Western Colorado Lodge. The Monarch Motor Lodge is now the Amigo Motor Lodge at 7350 U.S. 50. In the 1950s, the national mood was one of hope. The misery of the Great Depression was a fading memory and the sacrifices of World War II were at an end. People wanted to enjoy life, and many of them got into their cars and went out to see America. Where to house all those weary travelers? It was inevitable that a cheap, uncomplicated option from the tourist camps that were popular in the ’20s and ’30s would emerge. Thus, the motel scene exploded. Previously, during the 1930s, there was a push to improve the roads here. The dirt road that was U.S. 50 between Cañon City and Monarch Pass was oil-paved between 1935 and 1940. In January 1938, plans were made to reroute Monarch Pass over the divide, and the new pass was completed by that summer. Old Monarch Pass remained open as a scenic off-road route. Families loaded up their kids and set out for, among other places, Salida. Wilbur Foshay, Salida’s prominent chamber of commerce secretary, may have had a hand in bringing them here. In summer 1938, he set up heart-shaped way-finder signs that read “Salida, the Heart of the Rockies” all the way to the Kansas state line. These photographs are from the Salida Museum’s negatives collection, all taken during the 1950s and ’60s, the time of the “wish you were here” postcard, and they give a nostalgic glimpse back. 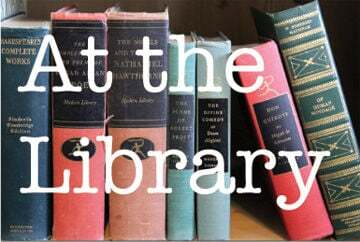 Joy Jackson is a desk clerk and archivist at Salida Regional Library and is webmaster for salidalibrary.org and salidaarchive.info.